When it comes to generating income most people think of bonds and little else, but they’re not the only option. A range of income-generating assets may offer more yield and time-tested benefits of diversification. the only attractive feature of this strategy. Studies have shown that income can be an important driver of total returns for most asset classes — not just bonds. While bonds are a traditional source of income, they can be risky and overvalued at times, underscoring the potential benefit of a multi-asset approach that includes stocks. It may come as a surprise to some, but income is a significant component of equity returns. 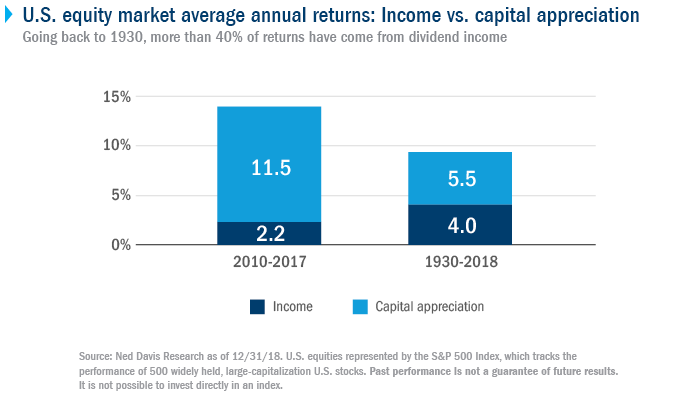 In the short term, equity market returns are driven by movement in stock prices, but going back to the 1930s shows that over longer periods of time, dividends — the income-generating component of equities — can provide even greater returns than stock price appreciation. In fact, dividend income accounted for over 40% of the returns from equity since 1930. More recently, stock appreciation has been strong and dividends have played a less important role in total return. From 2010–2017, dividends contributed just over 15% of total return, because it was a bull market and stock prices were increasing. As we return to more normal expectations for equity growth, dividends may again make up a larger portion of investors' total return. Melda Mergen, Deputy Global Head of Equities, often discusses how finding income in equity markets doesn’t mean you need to focus solely on the sectors that tend to deliver higher dividends, such as consumer staples or utilities. Income is an important component of equity returns across the entire stock market. For fixed income, over a period as short as five years, well over 90% of the returns come from the coupon, which is the income component of bonds.1 Since this will primarily determine returns, the focus within fixed income tends to be on finding sectors that provide the best value. Diversification is as important for an income-generating strategy as it is for any other investment goal. A well-diversified multi-asset portfolio may generate more income for the risk taken compared with stocks or bonds alone. 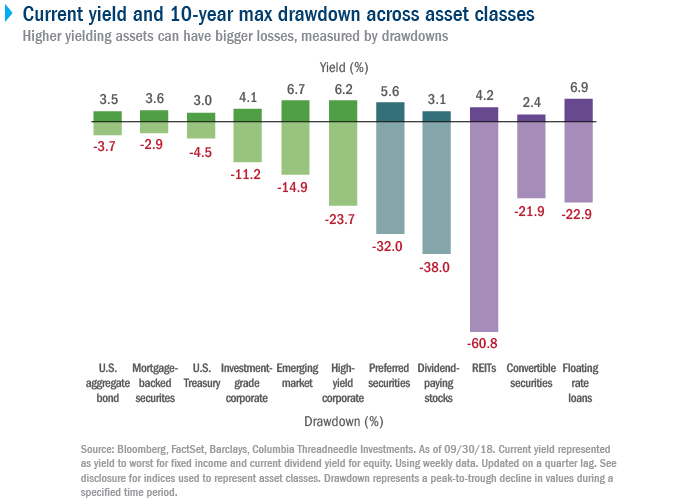 It’s the result of thoughtfully combining asset classes with low correlation to each other. As many of us know, too much exposure to one part of the market can be dangerous. It’s critical to recognize the potential for volatility when it comes to a portfolio focused on single asset classes. A portfolio based around a multi-asset framework can achieve higher income and lower its overall volatility by holding bonds, equities and less traditional asset classes. There are other, less conventional ways of eking out more income. One strategy is to invest in preferred and convertible securities, which over the long term may improve the performance of portfolios while potentially reducing the level of overall risk. Indeed, a well-structured multi-asset portfolio can access income from across the entire capital structure of a company’s balance sheet. Active management of an income portfolio is critical. Our preference is to be thoughtfully tactical so you’re able to capitalize on compelling opportunities as and when they arise — for example, underweighting bonds when they appear overvalued and overweighting other assets in higher yielding parts of the market when they’ve reached a desired value. A multi-asset approach that’s tactically managed may give your clients access to a more secure, less volatile income stream. The Bloomberg Barclays U.S. Aggregate Corporate Bond Index consists of publicly issued, fixed-rate, nonconvertible, investment-grade debt securities. The Bloomberg Barclays US Aggregate Bond Index (U.S. Aggregate) is a broad-based benchmark that measures the investment grade, U.S. dollar-denominated, fixed-rate taxable bond market. The index includes Treasuries, government-related and corporate securities, MBS (agency fixed-rate and hybrid ARM pass-throughs), ABS and CMBS (agency and non-agency). The Bloomberg Barclays U.S. Mortgage-Backed Securities Index includes 15- and 30-year fixed-rate securities backed by mortgage pools of Government National Mortgage Association (GNMA), Federal Home Loan Mortgage Corporation (FHLMC) and Federal National Mortgage Association (FNMA). The Bloomberg Barclays US Treasury Index (“U.S. Treasuries”) measures US dollar-denominated, fixed-rate, nominal debt issued by the US Treasury. The JPMorgan Emerging Market Bond Index tracks total returns for traded external debt instruments in emerging markets and is an expanded version of the JPMorgan EMBI+. As with the EMBI+,the EMBI Global includes U.S.-dollar-denominated Brady bonds, loans and eurobonds with an outstanding face value of at least $500 million. It covers more of the eligible instruments than the EMBI+ by relaxing somewhat the strict EMBI+ limits on secondary market trading liquidity. The Bloomberg Barclays U.S. High Yield Corporate Bond Index represents the universe of fixed rate, non-investment grade debt. The S&P U.S. Preferred Stock Index is designed to serve the investment community's need for an investable benchmark representing the U.S. preferred stock market. Preferred stocks are a class of capital stock that pays dividends at a specified rate and has a preference over common stock in the payment of dividends and the liquidation of assets. The MSCI High Dividend Yield Index aims to capture the high dividend yield equity opportunity set within a standard MSCI parent index by including only securities that offer a higher than average dividend yield (i.e. at least 30% higher) relative to that of the parent index and that pass dividend sustainability and persistence screens. The MSCI US REIT Index is a free float-adjusted market capitalization weighted index that is comprised of equity Real Estate Investment Trusts (REITs). The Bank of America Merrill Lynch All Convertibles All Qualities Index is a widely used index that measures convertible securities’ performance. It measures the performance of U.S. dollar denominated convertible securities not currently in bankruptcy with a total market value greater than $50 million at issuance. Floating rate loans are represented by the Credit Suisse Leveraged Loan Index, also known as the Bank Loan Index, which provides broad and comprehensive total return metrics of the universe of syndicated term loans.